The odds of the 49ers bringing back both Chris Culliver and Perrish Cox would appear to be slim to none. It’s not that they wouldn’t love to have their two starting cornerbacks for most of 2014 back, it’s just that there’s no way to do that under the salary cap. The early speculation around Culliver is that there could be a lot of interest in him on the open market, and he could end up getting a sizable offer from another club. After missing all of 2013 with a knee injury, Culliver rebounded well and was solid for most of last year. Overall he started 14 games for San Francisco and intercepted four passes. He also returned a fumble for a touchdown. While many expected Culliver’s strong play, the same can’t be said for Cox. An injury to Tramaine Brock forced Cox into the starting lineup early on, and he responded by having a career year. 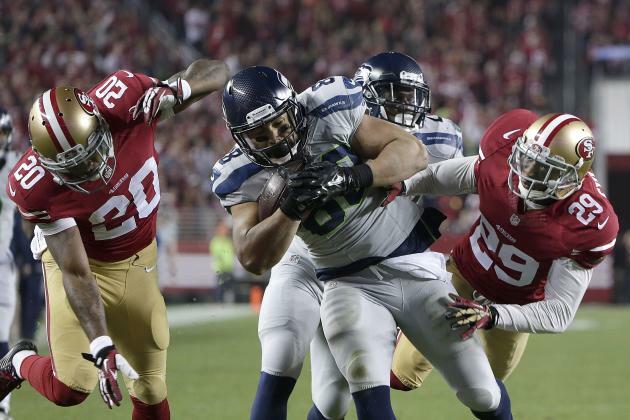 Cox made 14 starts and led the 49ers with five interceptions. He came into the season with only nine starts and one pick in his entire career. Some teams may be leery to throw a large some of money at Cox because of his small sample size, and that scenario would give the 49ers a better chance at re-signing him. If Brock comes back healthy, and Jimmie Ward and Dontae Johnson build off of some the promise they showed during their rookie campaigns, the Niners will have a good base to build from at cornerback. The team also took a flyer on Keith Reaser in last years draft, and that pick could pay dividends in 2105. While re-signing one of Culliver or Cox would be beneficial, San Francisco could always look to go in a different direction and sign an affordable veteran in free agency. One name to keep an eye on could be Brandon Flowers, who the 49ers showed some interest in last offseason. Be the first to comment on "49ers Free Agent Watch: Chris Culliver and Perrish Cox"